This post was co-written with Sarah Lyn Vollmer. The Paris Agreement sends a power signal that governments must shift global resources towards clean energy. One critical component of this effort must be to use scarce public resources to help meet the deep emissions cuts targets outlined in the agreement. In spite of this progress, some countries are still financing international coal projects with public resources. 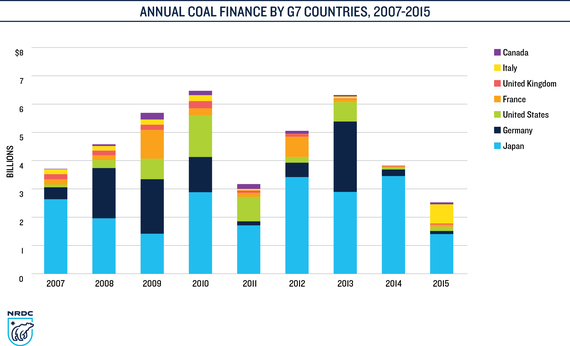 Japan, which will host the 2016 G7 meeting, continues to be the worst offender when it comes to public financing for international coal projects, providing $22 billion from 2007 to 2015. And while most countries show signs of ending their public financing of overseas coal projects, Japan financed $1.4 billion in coal projects in 2015 and is considering nearly $10 billion in future coal projects. The Natural Resources Defense Council, in partnership with Oil Change International, World Wildlife Fund, Kiko Network, Japan Center for a Sustainable Environment and Society, and FoE Japan, released a new report today entitled, Swept Under the Rug: How G7 Nations Conceal Public Financing for Coal Around the World. [Full database of the projects is available here (xlsx).] This report highlights the international coal financing from 2007-2015 by Group of Seven countries (known as the G7). The report is an update from a similar study we released last year. 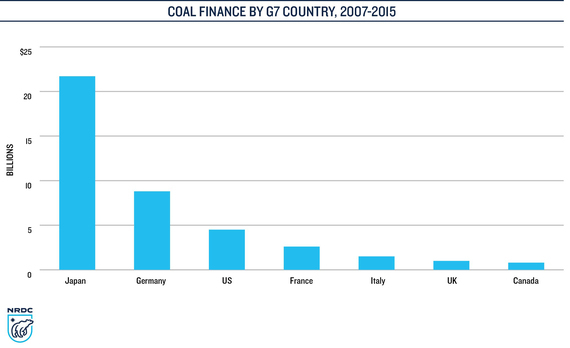 Unfortunately, our findings revealed over $42 billion of coal financing from the G7 countries from 2007-2015, with Japan clearly standing out as the worst offender (see figure). Japan outspent the other G7 countries nearly every year, with the Japan accounting for almost all of the funding the last two years as other countries showed signs of ending their funding of these projects (see figure). During the critical two year final push towards the Paris Agreement Japan funded almost $5 billion worth of coal projects overseas. During the course of 2015 countries in the Organization for Economic Cooperation and Development (OECD) were intensely negotiating an agreement to phase-out most public financing of overseas coal projects from their export-credit agencies. While this OECD negotiation was occurring and countries (including Japan) were publicly calling for the strongest international agreement to be adopted in Paris, Japan was continuing to actively fund coal-fired power plants around the world (see figure). In 2015, Japan provided $1.4 billion of public finance for three coal-fired power plants overseas with about 1,300 MW of installed capacity. The vast majority of Japan's international coal finance - 80 percent - was funded by its export credit agencies. These export credit agencies provide the back-end financial support which makes a project much more attractive for private financial institutions to bankroll the remaining finance. One would expect that after the Paris Agreement and new OECD rules these countries would dramatically reduce their investments in coal projects, if not virtually eliminate this spending altogether. However, Japan and Germany both continue to consider investments in international coal projects. Japan is considering providing over $10 billion worth of public financing to support a series of coal power plants around the world (see figure), which is almost a quarter of the $42 Billion USD that the G7 countries invested from 2007-2015.We have been able to document over 20 coal power plants that Japan is considering funding so the total funding value could be even larger as we have only been able to document Japan public investment values for 10 projects. In total, Japan is considering subsidizing coal power plants overseas with a total capacity of over 29 GW, which would contribute 1.2 billion tons of carbon dioxide to the atmosphere over the lifetime of the plant. The three largest projects under consideration by Japanese lenders are all backed by the Japan Bank for International Cooperation (JBIC): Batang Power Plant in Indonesia (a 2000 MW plant), Tanjung Jati B Expansion in Indonesia (a 2000 MW plant), and Toyo-Thai Power Plant in Myanmar (a 1280 MW plant). The new OECD agreement will cover financing from Japan's export-credit agencies so it will be critical to see if Japan finally turns the corner on its overseas coal financing and avoids moving these projects from "pending" to "finalized". Last month Japanese Environment Minister, Tamayo Marukawa, said that she wants to work with the G7 partners to jointly agree that "this is a year to put (the promises) into action". Putting the promises of the Paris Agreement into action will mean rejecting the use of scarce public resources to support international coal financing projects. While Japanese officials say the right thing, the international community has seen Japan slyly continue to invest in dirty projects. Japan needs to reflect on the age-old saying: actions speak louder than words. It is time for them to end this public financing of overseas coal projects.